Preheat oven to 180. Grease and line a 23 cm square tin. Melt 250g butter with 325g sugar, remove from heat. Sift 90g cocoa, 4 Tbsp flour, pinch salt and half tsp baking powder. Stir in melted butter and sugar, add 4 eggs and mix. Add 125g chopped nuts (I use pecan), I sometimes replace nuts with frozen cranberries (as in picture below), and 200g chopped dark chocolate, mix to combine. Pour into prepared tin and bake for about 25 minutes. In November last year, House and leisure approached us to work with them on an event for a Mr Price launch. The theme, ‘We go together’, we came up with the following menu and a few pictures we managed to take during the event. 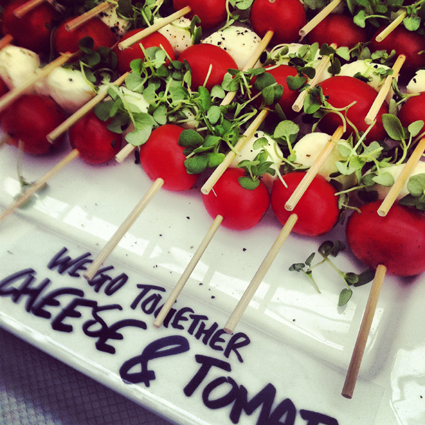 Bocconcinni mozzarella, cherry tomatoes and micro basil on skewers. Rye rounds topped with quail egg and dusted with bacon crumbs. 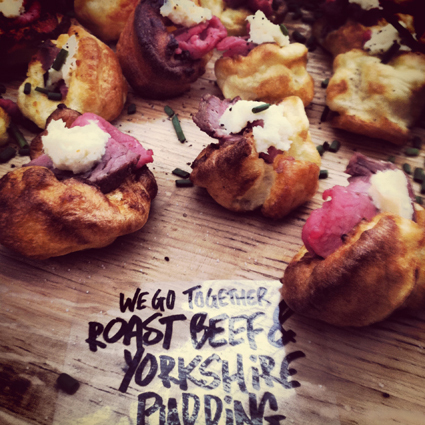 Rare roast beef served in Yorkshire pudding with horse raddish cream. Smoked salmon roses with cream cheese and soy flavoured pearls. Blue cheese tart topped with caramelised fruit. Fish goujohns with string fries and home made tartar sauce, served in paper cones. Mini home made sausages with creamed potato. Chicken tikka massala served in mini brioche bread bun. Mini pasta shapes served in cream sauce, topped with parmesan. 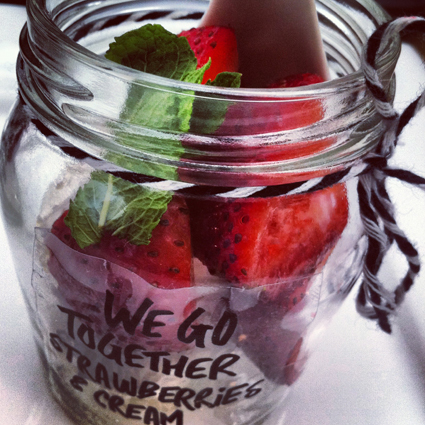 Mini consol jars with fresh strawberries and thick cream. Bread and butter pudding (made with croissants and white chocolate). 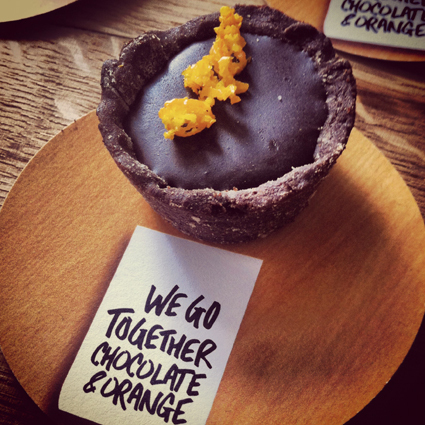 Mini short crust pastry chocolate and orange tarts. 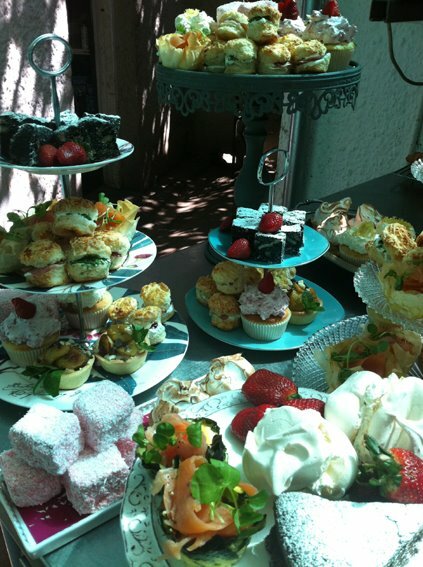 We catered for the House and Leisure road show, what a pleasure catering for such an appreciative audience! 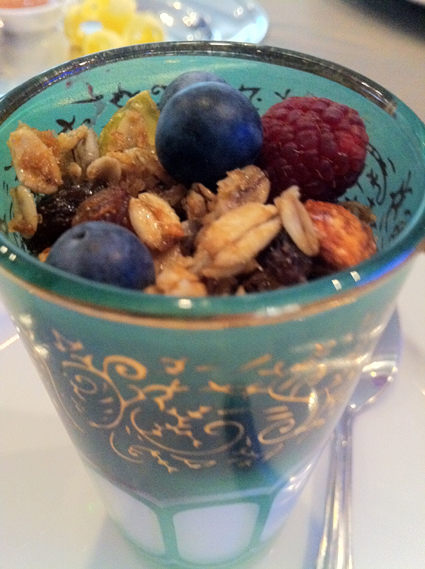 Moroccan tea glasses with Greek yoghurt, home made muesli and berry coulis. 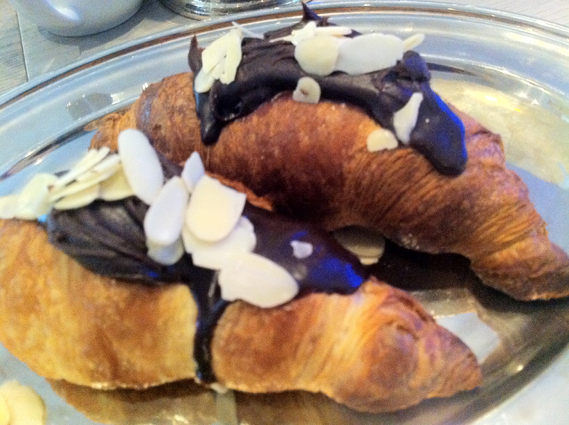 Freshly baked croissants topped with Belgian chocolate ganache and flaked almond. Crisp rye toast topped with ribbons of smoked salmon trout and fresh dill. Rustic freshly baked banana and pecan nut bread served with butter and honey. Home made scones with thick cream and raspberry jam; and Parmesan, paprika and chives. 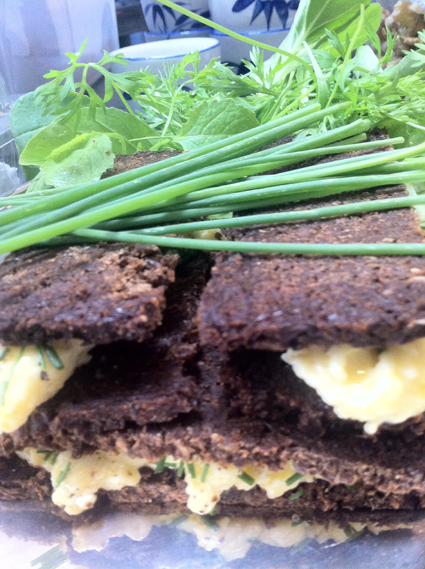 Dark rye bread sandwiches with creamed eggs and chives. 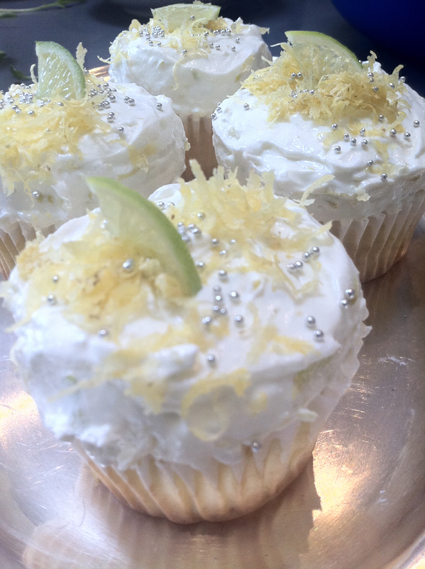 Lemon curd cream cup cakes. 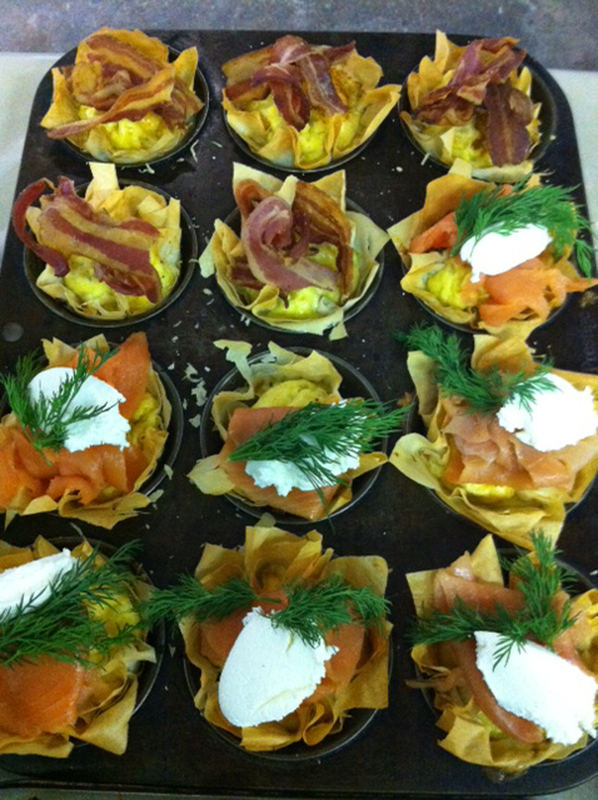 Mini savoury pancakes with smoked salmon, cream cheese and quail egg. Thai chicken satays with a tangy lime and ginger sauce. Home made flat bread topped with wild rocket, grilled bringal, parmesan shavings and a balsamic reduction. 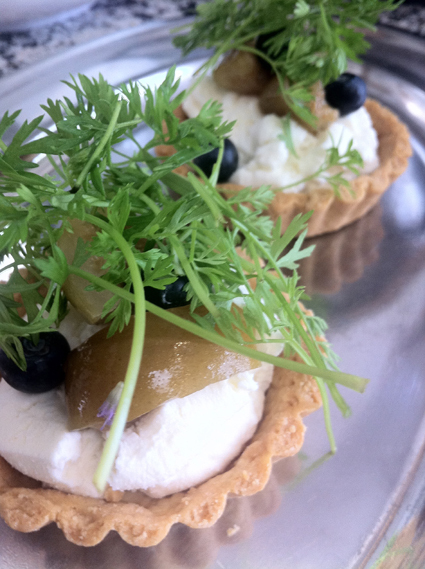 Short crust pastry tart filled with goats’ cheese cream, topped with fruit and micro greens. Caramelised onion, blue cheese, walnut and thyme tart. Chocolate and pecan nut brownies. Mini meringues sandwiched with raspberry cream. Brut chocolate cookies sprinkled with brown sugar. Mini pots of chicken liver parfait with wafer thin melba toast. 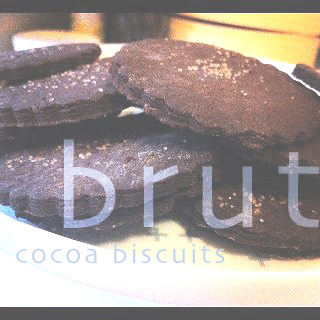 These are especially dark, salty-sweet chocolate biscuits, the best I’ve ever had! Sift flour, cocoa and salt. Mix butter, granulated and brown sugars, and honey till fluffy. Add dry ingredients gradually. Wrap dough in plastic and refrigerate for at least 30 minutes. Grease baking sheet. Roll out dough and, using scalloped edged cookie cutter, cut out biscuits. Arrange on baking sheet, sprinkle with sugar and bake for 10 minutes. Transfer to wrack and cool. 1. Variety of sandwiches: Cucumber; Ham and a whole grain mustard mayonnaise; Cream cheese and pesto; Roasted chicken and home made mayonnaise; Ribbons of smoked salmon trout with cream cheese and fresh dill. 2. Home made scones with thick cream and raspberry jam. 3. Home made cheese scones with chive and cream cheese butter. 4. Variety of quiches: Butternut and Danish feta topped with crispy sage; Quiche Lorraine (caramelised onion and bacon); Onion marmalade with fresh rocket and balsamic roasted cherry tomatoes; Goats cheese, tomato and thyme. 5. Variety of tarts: Blue cheese, pecan nut and fresh thyme; Onion marmalade, fresh tomato, torn olives, fresh thyme and goats cheese; Butternut, crispy sage and walnut; Goats cheese cream and caramelised fruit topping. 7. Chocolate and pecan nut brownies. 8. 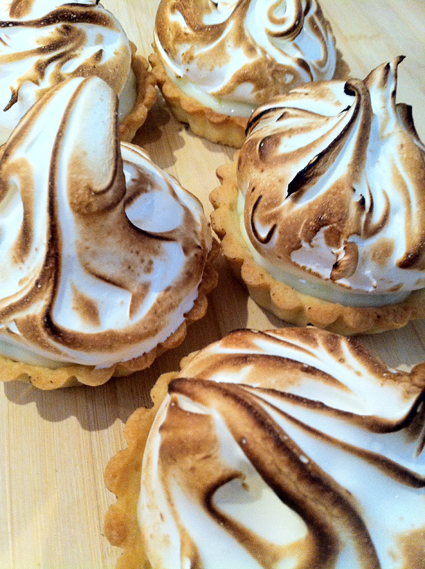 Mini lemon meringue pie. 9. Pancakes with lemon wedges and cinnamon sugar. 10. Cup cakes: Vanilla with flavoured butter icing; lemon with lemon curd and meringue topping, chocolate ganache: white and dark. 11. Seasonal fruit platter with fresh mint sugar. 12. Mini tarts filled with caramel and topped with roasted banana and burnt sugar syrup. 13. Meringues or mini pavlovas with lemon curd cream and seasonal fruit. 14. Mini pots of vanilla creme brulee. 16. 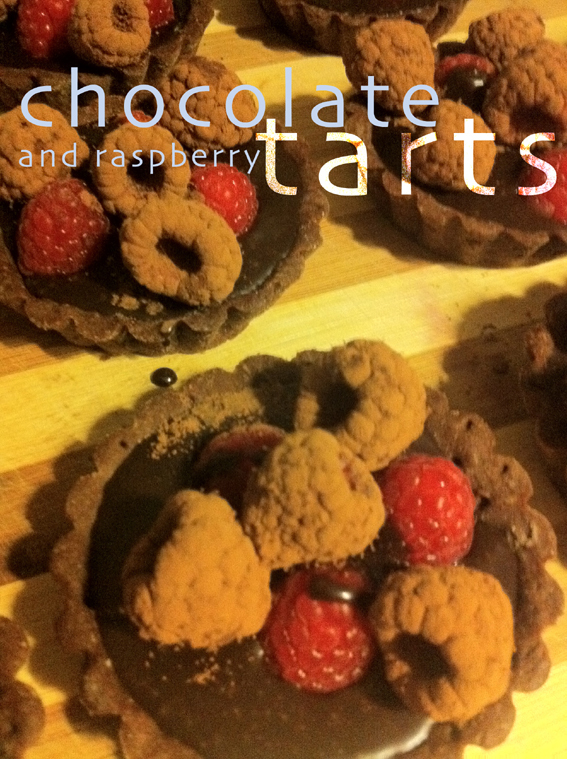 Mini short crust pastry tarts with: chocolate cream and berries; lemon curd cream; or raspberry cream and fresh berries. 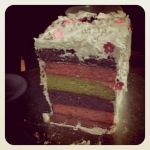 This is a layered sponge cake a I did for a friend, smothered in Italian meringue. 1. Butternut risotto balls stuffed with blue cheese. 2. 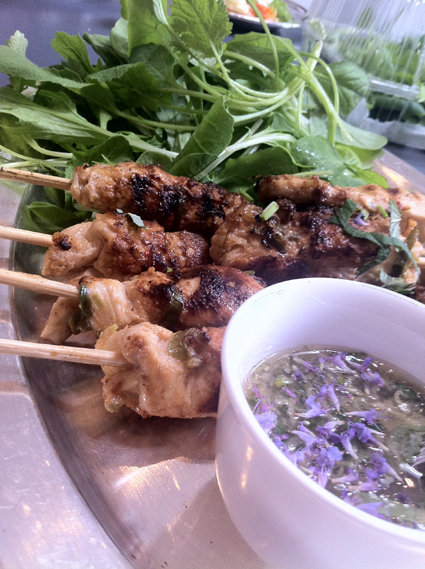 Thai chicken skewers drizzled with peanut sauce and freshly chopped coriander. 3. Teriyaki style beef skewers. 4. 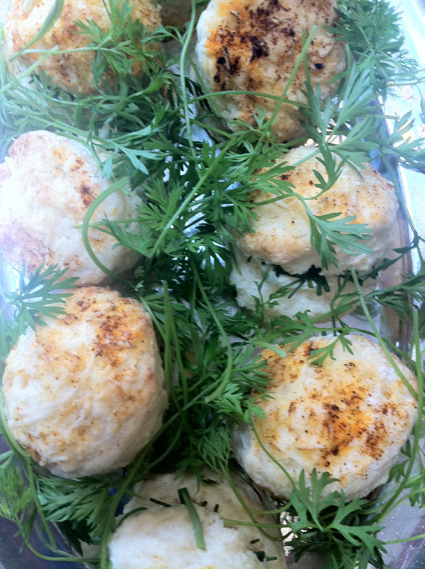 Juicy prawn tails served with a dill mayonnaise. 5. Mini caprese salads of bocconcini mozarella, fresh basil, cherry tomatoes and pesto. 6. 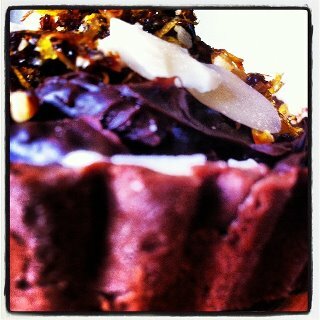 Mini tarts with blue cheese, roasted walnuts and caramelised onion. 7. Mini filo quiche: Mushroom, caramelised onion and parmesan. 8. Mini beef fillet rolls with caramelised onion, aioli and seasonal leaves. 9. Grilled thinly sliced aubergine rolled with a herbed cream cheese and flaked almonds. 10. Vegetable spring rolls served with a ginger, lemon grass and soy dipping sauce. 11. Mini pita bread stuffed with a home made hummus, roasted chickpeas and fresh rocket. 12. 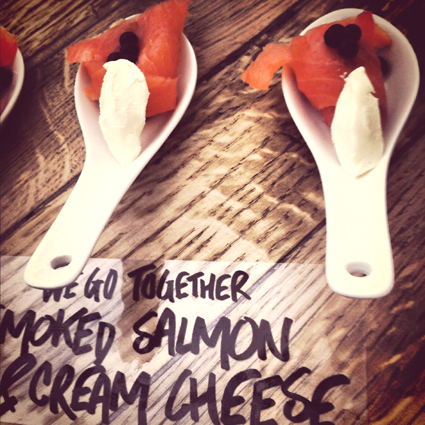 Ribbons of smoked salmon trout served on mini savoury pancakes with cream cheese, fresh dill and cracked black pepper. 13. Mini Asian fish cakes with a tangy dipping sauce. 14. Mini pies: Roast chicken and mushroom; Beef and onion; Lamb curry; or vegetarian chickpea and butternut. 15. Bruschetta topped with a variety of meats, cheeses, chutneys, pesto and seasonal leaves. 16. Mini chicken drummets marinated and grilled on the fire. 17. Cucumber ribbons wraped around marinated bocconcinni mozzarella and skewered. 18. Home made flat bread topped with smoked springbok carpaccio, rocket, grilled bringal and a balsamic reduction. 19. Short crust pastry tart with roast butternut, caramelised onion, crispy sage and parma ham. 20. Sweet onion and potato fritatas. 21. Home made ginger biscuits with goats cheese and caramelised fig. 22. Blue cheese pannacotta topped with honey roasted pear and nuts. 23. 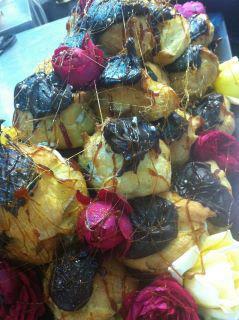 Short crust pastry tart with a goats cheese cream and caramelised fruit topping. 1. 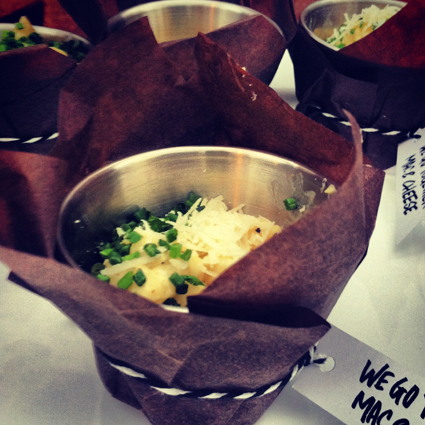 Mini bowls of Thai green curry: Fish; beef, vegetarian or chicken with basmati rice. 2. Mini bowls of Indian lamb or beef curry served with basmati rice and a mini popodum. 3. Mini bowls of pasta bows with a creamy butternut sauce topped with crispy sage and parma ham (optional). 4. Mini bowls of flavoured mash with cocktail sausages. 5. Mini pot pies: Roast chicken and mushroom. 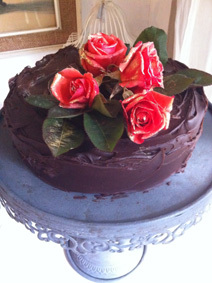 Last week I made this chocolate ganache cake for Kim’s birthday. 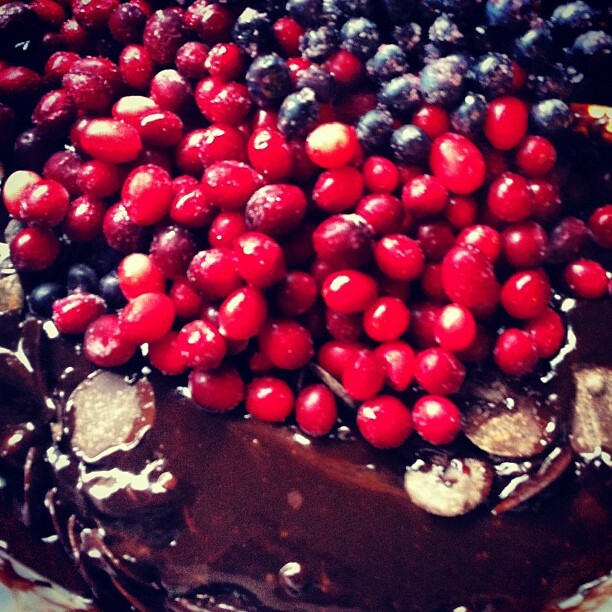 It’s a rich, dense cake that lasts longer than most cakes. Set oven at 180, grease and line 25 cm cake tin. Melt butter, chocolate, coffee and sugar on low heat till dissolved. Whisk in sifted dry ingredients, add eggs and vanilla, whisk to combine. Pour into tin and bake for one hour, remove and leave to cool in tin. Heat cream and add chocolate, stir till melted.